The lists of the winners differ from country to country, so to be more specific Photo Lab has been nominated and picked the trophy as the hottest app in Russia . For us, it is a huge step forward and the sign of recognition of all the significant changes we were introducing through the year not only from the Play Store team but also from you, our users. The impact of Photo Lab users is truly huge. Every day hundreds of thousands of people choose to use the app for a variety of photo editing needs, with hundreds spending their precious time giving us stars (the average rating has almost never been lower than 4.5 ), leaving reviews (more often good than bad) and emailing all kinds of feedback to us. That all gives us food for thought, helps to improve the app, detect and fix minor and major bugs on time, and even makes us roll back new features sometimes (C’est la vie ). It’s only natural that we see you more as a part of the team and would like to share this victory with you. So CHEERS!  and let’s keep the ball rolling by spreading the word about this terrific news! Фотолаборатория очень-очень нравится на 5 баллов. osome application i just love it very easy to use. Danke an Euch species, weiter so!! For me it is an excellent app. Muy merecido premio! Felicitaciones y gracias por ayudarnos a embellecer y divertir nuestras fotos. Que sea el comienzo de grandes logros..
A mí me encanta esta aplicación de echo todos los días encuentro una imagen Qe me fascina y la aplicó en mis Photoshop y las comparto con los contactos que tengo en el facebook y en Instagram ! This app is lot of usefull app and it has different types photo editing ideas. I love this app. Please all are welcome this app…..
Me parece interesante aunque no la uso mucho porque a veces no entiendo bien los pasos a seguir porque hay términos que para mí no son muy claros o con significado diferente. Felicitaciones! Soy de Chile y me encanta la app, es fácil de usar y da para hacer mucho con creatividad.saludos! We helped you to reach this milestone and its now your time, you does you help us to give the photo lab all features for free, that means why can’t you celebrate this with us by providing pro version for free??? Amei esse aplicativo,é tudo de bom. Felicidades! Un Premio muy merecido es una excelente aplicación. Herzlichen Glückwunsch zur besten App ! kostenlosen Verfügung stellt! Liebe Grüße R. B.
I like Photo Lab Very Much. Мне очень нравиться приложение! Очень необычное,яркое,неординарное оформление фотографий! Спасибо! I like the app very much but why can’t I use the “pale man” transformation in the face montages section? & u should add more on face montages. I really love this app. I love this app I use it all the time. We need cooler stuff. Bring back the butterfly wings over the eyes!! Epic haven’t seen it in a long time. I love this app. Ma ne da ste dobri nego odlični! Congratulations !! 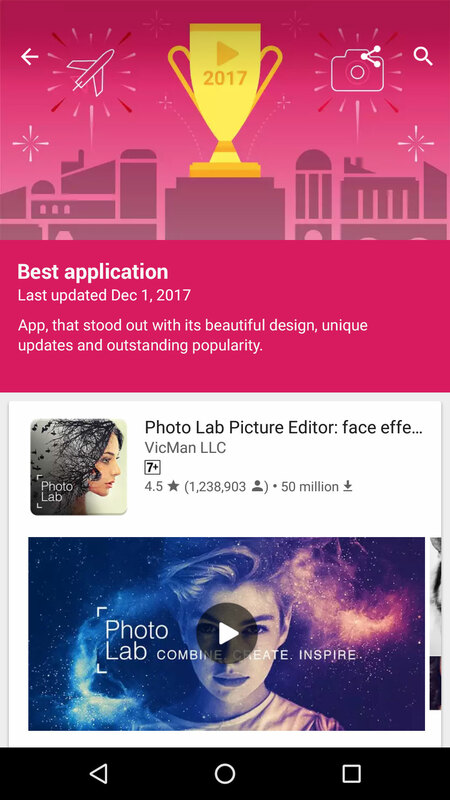 Looks like the app has jumped into a huge puddle and is going to land in the footsteps of superimpose , afterlight , youcam perfect , youcam makeup , photogrid , phonto , eraser / cut / paste , picsart , repix and a lot of other popular and most used apps .Bright future awaits .Update , give some changes , give more offers and features and creative designs .I have a great experience using photo lab .It makes my photo look gorgeous with the effects and unique designs .I recommend it as a unique app among all for all of its unique effects and designs .Photo lab deserved the award from google for being the best application of the year 2017 , in my opinion .I think photo lab has improved a lot this year .Take a greeting from me and wish so you can work more in the future to make it better and to achieve something .Best of luck! Bravo l’équipe photolab. Vous le valez bien. Фотолаб действительно классный сайт, можно так преобразить свое фото, что раньше даже не мечтал ось!!! Congratulations y’all! I love this app myself! Parabéns! Estou feliz como se tivesse ganho um prêmio. Agradeço por dividir toda essa alegria comigo. Sou muito sincera e falo de vocês e mostro para todos. Obrigado! Grande abraço a todos! Um brinde! Photo Lab is really best of the best! My congrats to all users! And many many thanks to PL’ team! Excelente aplicativo para mim é o melhor , fácil de usar e sempre trás filtros novos. this can only survive the brave team. Not a gram of gebzition. Приложение супер,мне очень понравилось,желаю вам удачных и интересных разработок. I would like more magazine covers for babies, toddlers, children, parenting…. Photo lab è una applicazione molto bella!! Yes Photo Lab is absolutely the best App; I love it! Realmente, esse aplicativo és muito bom. Agradeço a vosmecê por ter feito este aplicativo!! This is by far my favorite app! I could stay on it for hours… And sometimes I do LOL. Los conocí de casualidad y es muy buena. MUCHAS FELICIDADES AL ESFUERZO EN EQUIPO. j’utilise photo lab tout les jours.Bravo,mais j’ai besoin d’être récompensé aussi pour cela.n’est ce pas? When I first downloaded photo lab it gives you the option to see all the effects, but you can only use certain ones. I was then given a choice for a free 3 day trial. It was the trial that got me using the app and filters which has made me continue to use the app and buy a subscription. I Love it I B with out it……just add more stuff to it. Love it best app ever!!! The dopest app I’ve ever used? Next to the Bible app lol!!! Me encanta la aplicación ,,es muy buena…y divertida ..
Tra le app grafiche che utilizzo nel mio dispositivo….posso dire che “Foto Lab”é la migliore in assoluto, sia come fantasia…sia come colori…! I miei contatti sono strabiliati e mi chiedono:”ma come fai…?”…manco fossi io…!! Ma la bacchetta magica c’è l’ha “Foto lab “….!! Excellent! Photo Lab deserves this over all apps! Great Job Photo Lab!!!! And thanks for sharing your genius and letting everyone share theirs too! CONGRATULATIONS!!! WELL DESERVED! I’VE ENJOYED USING YOUR APP FOR A LONG TIME NOW. MY FRIENDS AND FAMIKY LOVE RECEIVING THEIR PICTURES USING YOUR APP. THANK YOU FOR PROVIDING THIS HIGH QUALITY AND EASY TO USE APPLICATION! ALL THE BEST TO YOU AND YOUR TEAM FOR A GREAT 2018!!! Que bueno!!!! Los felicito me encanta esta aplicación, se lo merecen, felices fiestas!! Congratulation. It’s one of the best sight. Sim vocês são ótimos! É para ajudá-los, a se manter nesta classificação de bons. Vou dar a minha sugestão. Vocês já pensaram na ideia de, alterar o fundo das fotos? Alterando e dando como sugestão imagens: de cidades, países, paisagens, paisagens com aventura. Explicar melhor, nos termos uma foto simples e, tiramos todo o fundo. Colocamos escalando a torre Eiffel. Espero que eu tenha sido Clara e, também tenha ajudado. E para deixar ainda mais claro, eu adorooooooo este aplicativo. Grata, por querer saber da minha opinião. Abrindo este espaço. I also like this app…..!